We buy our ewe’s milk from Simon Stott, at Laund Farm, Chipping, Lancashire. Simon won the NFU’s Farmer of the Year title in 2011 which is a fantastic accolade. We have been working with Simon for over ten years and are extremely happy with the quality of his milk and we (I) have a soft spot for Andrew, his delivery driver who celebrated his 70th birthday last year and looks a good twenty years younger! A couple of weeks back, at the end of January, we had our first sheep make of 2012. For us, as we are so small, with limited equipment and limited people, making sheep is a full on, hard, hands on job. For our first make, there was Stu, Lydia, me and one of our part timers, Mark and we made 2,000 litres split between two vats. There is a lot to consider: yield, manpower, press space, the number of pots etc. Depending on the type of cheese you are making, the time of year, the quality of the milk: feed, husbandry methods etc, one can typically expect a 10% yield on goat milk, so for example, for each 1,000 litres of goat milk processed, you would have approx 100kgs of curd. For cow, this can be 10-12% and for ewe’s milk, it can be 16-20%, depending on recipe. This has serious implications as to the size of your vat, man power and your ability to shovel large amounts of curd. When I first started making cheese, I was told by another small cheese maker that there were marked differences between the different milks, each one being very different to work with. This initially really worried me and now that I have a little more experience, I am not entirely sure that I agree. I find that ewe’s milk sets beautifully and very quickly, with a very firm set. Goat seems to take the longest with a less firm set and cow is in the middle. 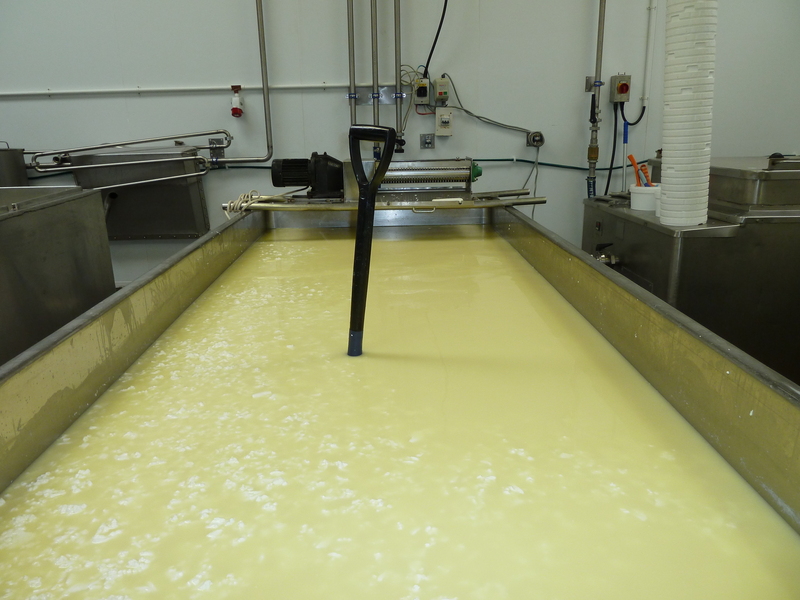 Yields are obviously different so that dictates the amount of curd in the vat and pressing space. I think I see the differences more in terms of different cheese makes irrespective of the milk type. Below are some pictures of our first sheep make of the year. The picture left shows Mark stirring the vat after we had first cut the curd. 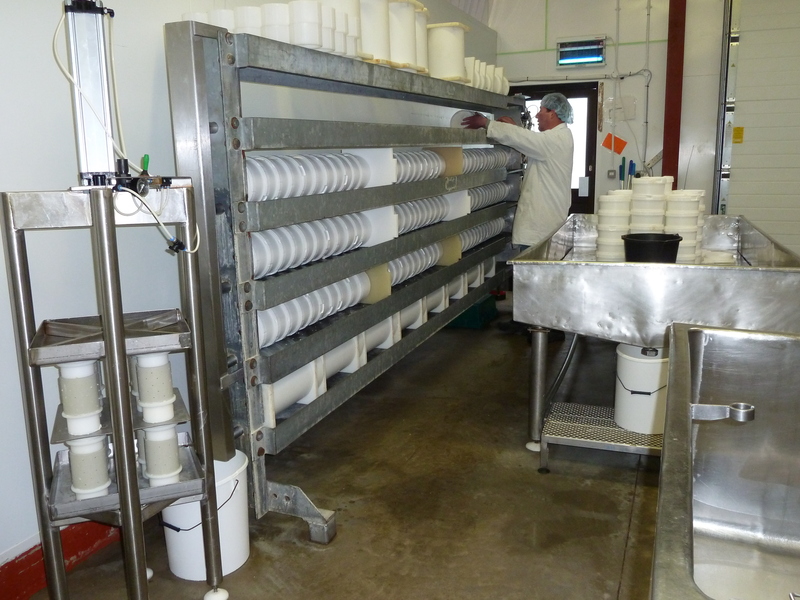 This is really quite hard work as there is approximately 150kg of curd and to keep it going takes a lot of stamina. 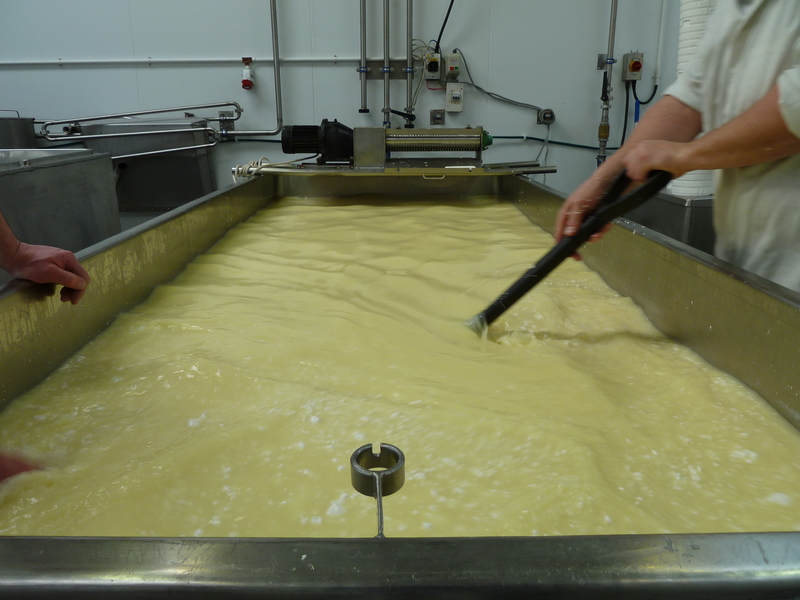 We had so much curd in the large vat that for the first time ever, we could stand the shovel up in the curd. Whey off takes slightly longer as we have more curd and we take care not to disturb the curd when we are taking the whey off. The blocks we cut are larger than normal because there is so much curd in the vat we run out of room if they are smaller. I find turning the blocks really difficult because they are so large and bulky. incredibly thick. 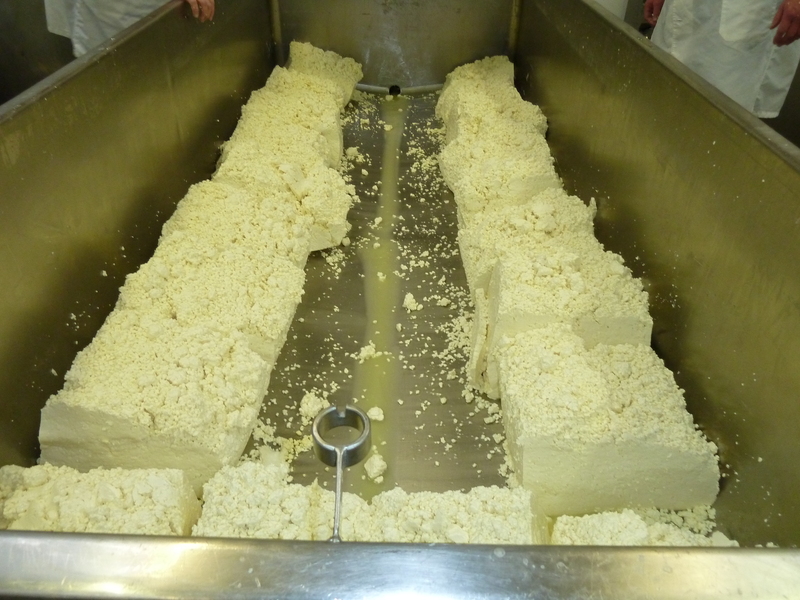 Shovelling or turning the cubes after cutting is hard work simply because of the volume of curd in the vat. This is why though we have a 1,900 litre capacity vat, we would never put more than 1,500 litres of ewe’s milk in it because it would become unmanageable. And because of the sheer amount of curd, potting up seems to take an age and take up all of our pressing space which is again why we schedule in sheep makes very carefully so that we have maximum dairy capacity. This sounds fabulous – I bet you were all tired after that day! When will the sheep cheese be ready and what kind of cheese were you making? It’s great that you stir it all by hand – guess your arm muscles must think so!